All three editions of Battlefield 1 have special pre-order bonuses that we show you below and we also listed what extras included in all editions, where it does not matter if you pre-ordered it or buy after the release. In the Standard Edition, you can enjoy also the pre-order bonuses. - An approximately 35 cm tall. - A sleeve for carrier pigeons, which contains codes for the DLCs. - A game card set in Battlefield optics. - Playing with all bonuses and extras of Early Enlister Deluxe Edition. The special feature of this version is that you can already go into battle three days before the official release. But have to pay $ 80 to 90. But do not worry, you will also receive additional bonuses and extras. - Red Baron package with three Earth Shrouded, the gun P08 and the emblem flyer needle. 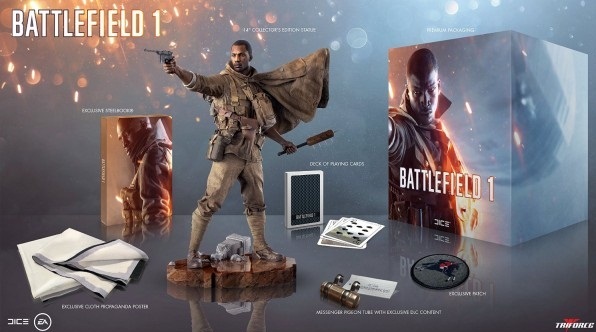 - Lawrence of Arabia package with a black stallion, the weapon SMLE, the sidearm Jambiya and an emblem. - Sense of the train, the airship and the battleship and five Battle Packs. All pre-orders will be rewarded with additional bonuses. Among them included is a pre-release access, which allows you to play a multiplayer map than seven days before everyone else. In addition, you will receive even the Hellfighter package (incl. Trench Shotgun, M1911 and Bolo Knife). Ordered you the digital version, you get a free month EA Access (Xbox store) and an exclusive design (PSN Store).